Ashington FC’s assistant manager Ian Skinner looked on as his outfit destroyed Newton Aycliffe and hit double figures in a 10-1 victory at Woodhorn Lane on Tuesday night. And straight after the game he was quick to describe the display as being ‘professional’. “Tonight we have seen a professional performance from our boys and full credit to them for that,” he said. “People will look at the Newton Aycliffe team sheet and not recognise too many of the names, and a little bit of that is to do with the fact that they are in a cup final on Good Friday, but that is of no interest to me. 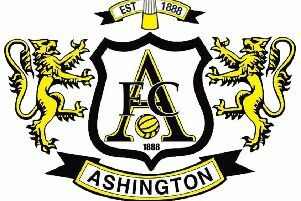 “The only thing which I was bothered about was Ashington had to play Aycliffe – and we comprehensively beat them. “Again people will say we were up against a weakened side, but in my eyes it was a professional performance from our players. “I can think of Premier League teams who have played non league teams in cup competitions and not scored ten goals. “It is no easy feat to record double figures against anybody, yet we have done that, and although I may be sounding a little bit on the greedy side, we could have had more. “There were some really, really good team goals, but one of the most pleasing things for me is that we were 5-1 up at half-time and what usually happens in that situation is players switch off and stop playing – with the opposition happy for that to occur with the game consequently petering out. “But we made a massive point at half-time about making statements; being ruthless; getting into good habits; not taking our foot off the gas and finding a rhythm ready to go to North Shields on Saturday. “It was good because when it gets to five and six, people start playing as individuals and not collectively as a team because they all want to get onto the score sheet, but our lads didn’t do that and played as a team throughout the whole game. “It may be a trivial thing but another pleasing aspect for me was that after our tenth goal, every player went across to congratulate Andrew Johnson, whereas people just think it’s another goal. “That shows that although we have been through a bit of a tough spell, we have turned the corner a little bit. “We have three wins and a defeat in our last four games and the lads have started to enjoy their football again. “We were probably a little bit unfortunate not to come away with a point at Bishop Auckland last Friday, and tonight this was probably our best performance of the season. “The main reason why I say that is because three or four of the goals were ‘team goals’, where we have built the play and got into the final third. Skinner admitted that the only grievance was conceding midway through the first period. “We are due a clean sheet,” he added. “There was a throw away comment in the dressing room, ‘we’ll get you one soon Conor’, which is in relation to a clean sheet for our keeper Conor Grant.